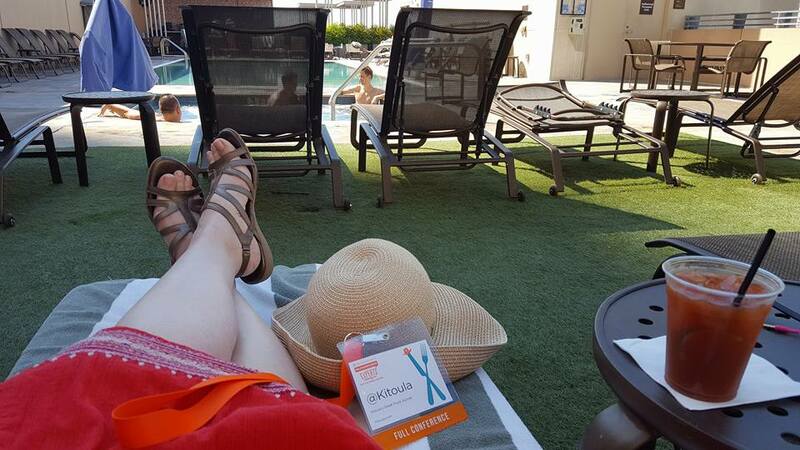 Better late than never, here’s my BlogHerFood16 Wrap-Up. 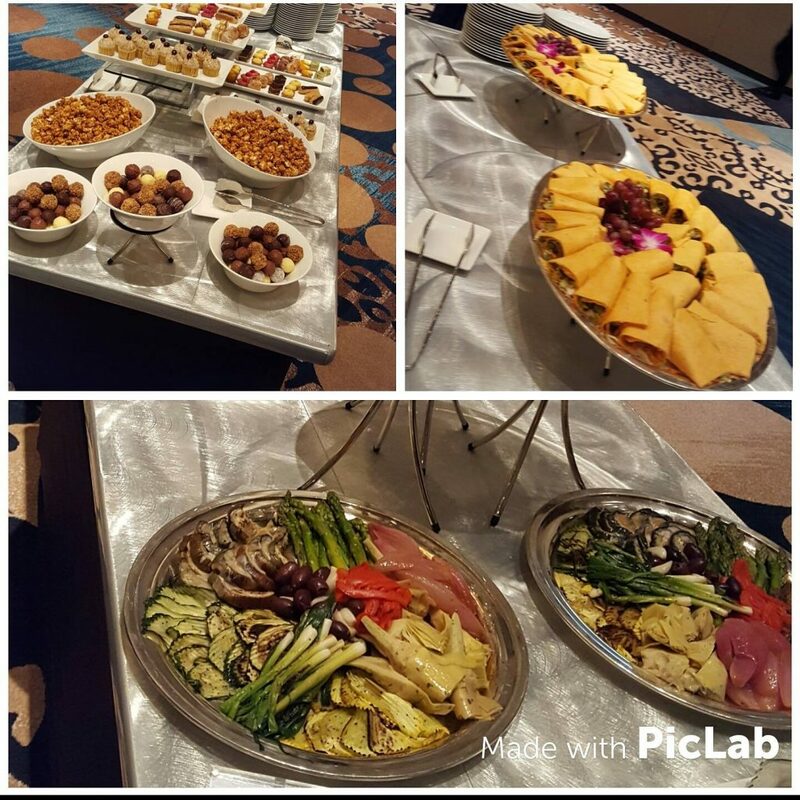 All I can say is BlogHerFood16 in Austin Texas was amazing! Nah, I can say a lot more. And I have lots of photos to share with you too. 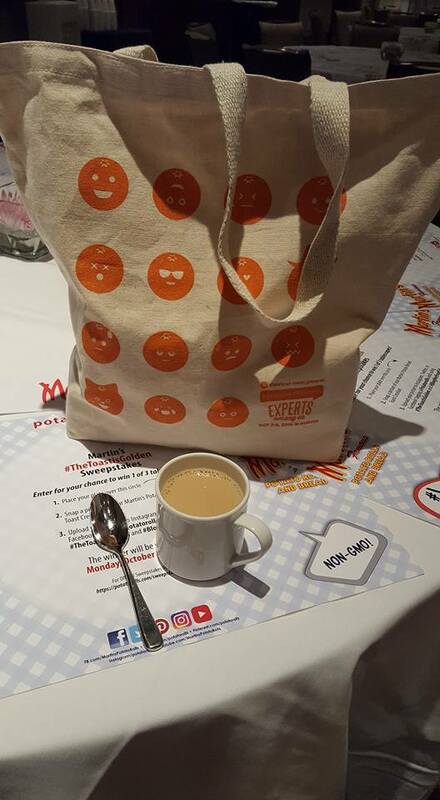 Upon check-in I received a canvas tote bag filled with lots of foodie swag and treats from quite a few of the sponsors: Martin’s Famous Potato Rolls, Heluva Good Dip, Lentils.CA, American Dairy Association, American Egg Board, Enjoy Life Foods, National Confectioners Association, and RX Bar*(s). 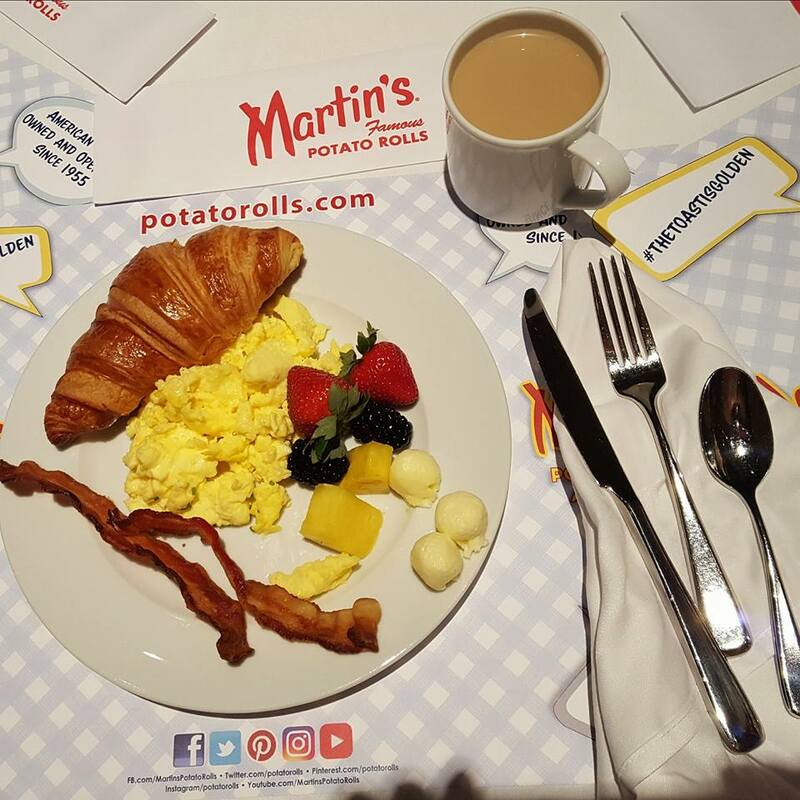 Breakfast was sponsored by Martin’s Famous Potato Rolls & Bread. 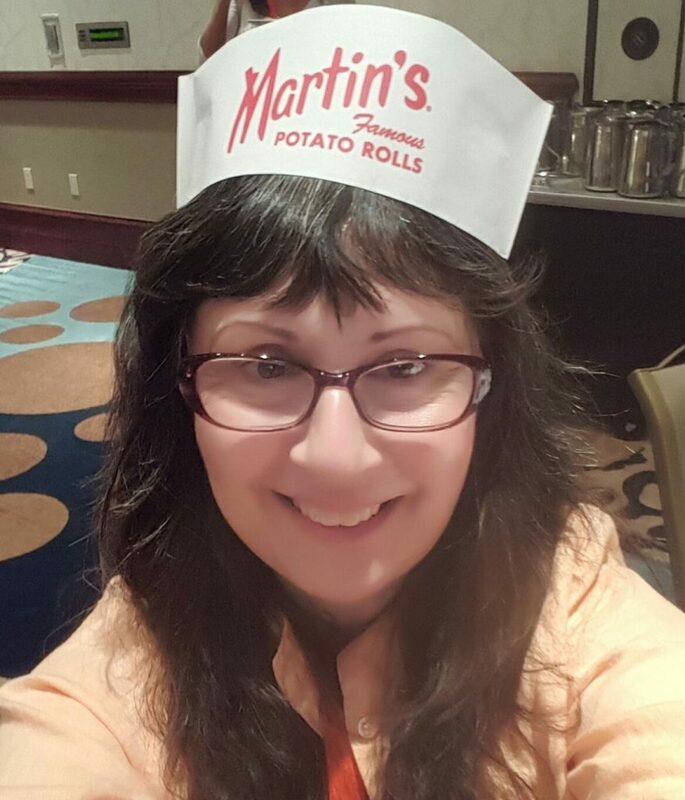 During breakfast, Martin’s @potatorolls had a fun Instagram contest, with the hashtag #thetoastisgolden. It was a cute idea to have the instructions for the contest printed on the place mats. My favorite speaker and break-out session was with Jane Ko, travel & restaurant expert, and blogger @ A Taste of Koko. How generous of Jane to share all her Instagram tricks and tips. I’ve been using her techniques on my Instagram account since the workshop. They work. I’ve been getting more Followers and more engagement. 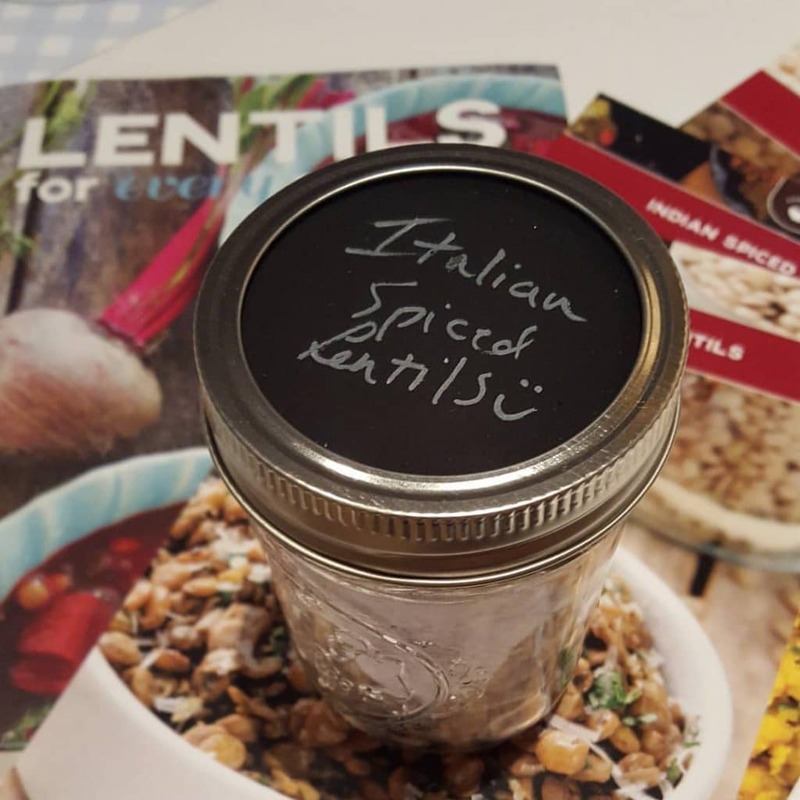 Did you know that lentils grow in Canada? Canadian Lentils, Lentils.CA, one of the conference sponsors, is a brand funded by Saskatchewan Pulse Growers. SPG is accountable to and funded by over 17,000 farmers in Saskatchewan. The organization’s mission is to nourish the world through profitable pulse production. Pulses are a protein-packed, and earth-friendly food we know as beans, chickpeas, lentils and dry peas. So, eat lentils for your health and for social good. Lentils! Who knew? 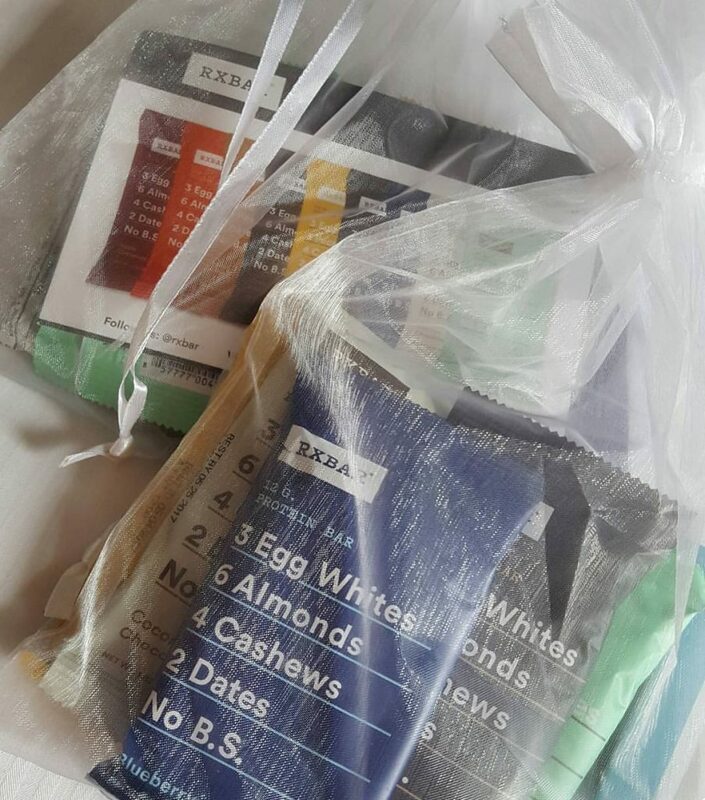 A bag of bars were waiting in my hotel room Friday afternoon. RX Bar*s have no gluten, no soy, no dairy, and no added sugar. Their main ingredients are dates, egg whites, almonds and cashews. I like the chocolate ones the best. Sometime you need a break from even the best of food blogger conferences. By the pool with Bloody Mary; need I say more? Did I mention Yianni came along on the trip? It was our first time in Austin. 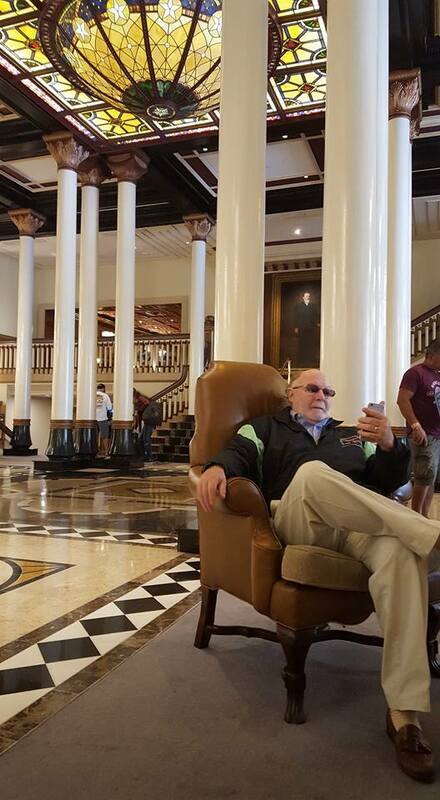 Here he is at The Driskill, an historic hotel more than 100 years old. It was built in 1886 as the showplace of cattle baron Jesse Driskill. Fun fact: Former President Lyndon B. Johnson awaited news of his successful 1964 election as President of the United States from the mezzanine-level Jim Hogg room. Good times! 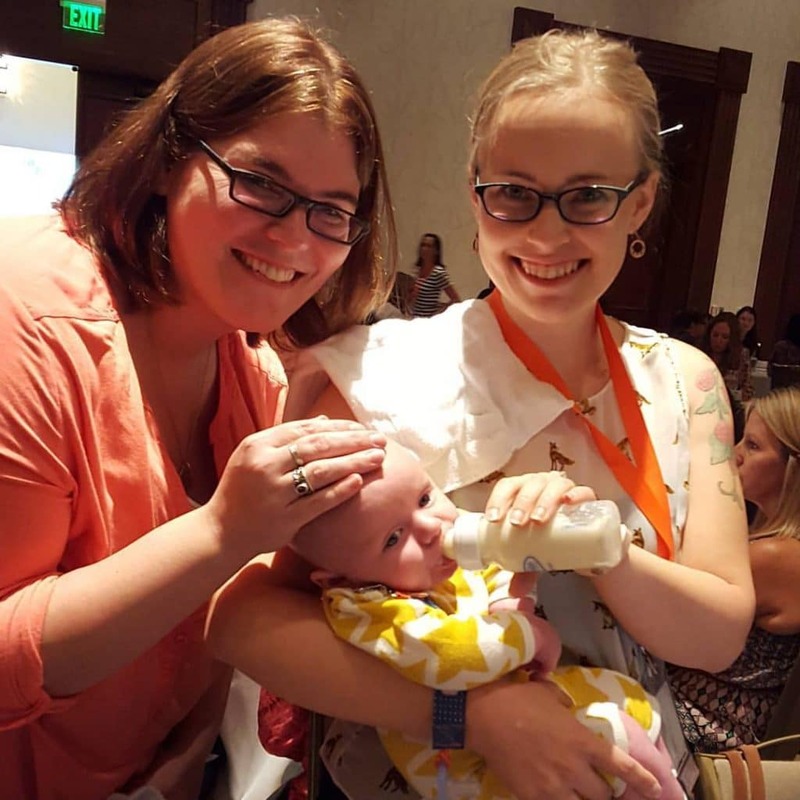 Thank you BlogHerFood16! 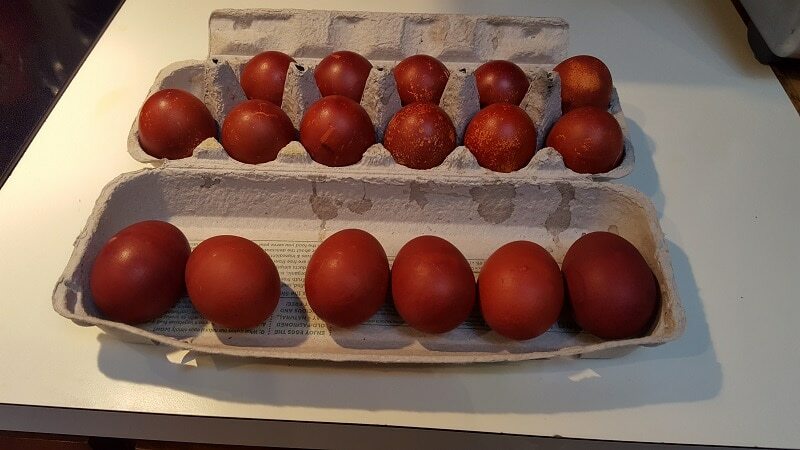 One of the oldest Easter traditions for Greek Orthodox Christians are Easter eggs dyed red. 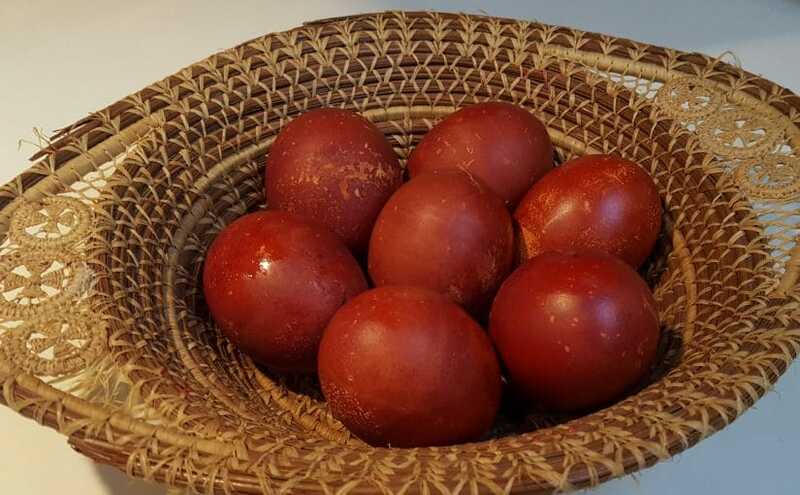 In the Orthodox Church, Easter eggs are dyed red to represent the blood of Christ, and the hard shell of the egg symbolizes the sealed Tomb of Christ — the cracking of which symbolized his resurrection from the dead. You can dye eggs naturally using the skins of yellow onions. I used the skin of 10 small to medium sized yellow onions and all the skin that was loose in the net bag they come in from the market. 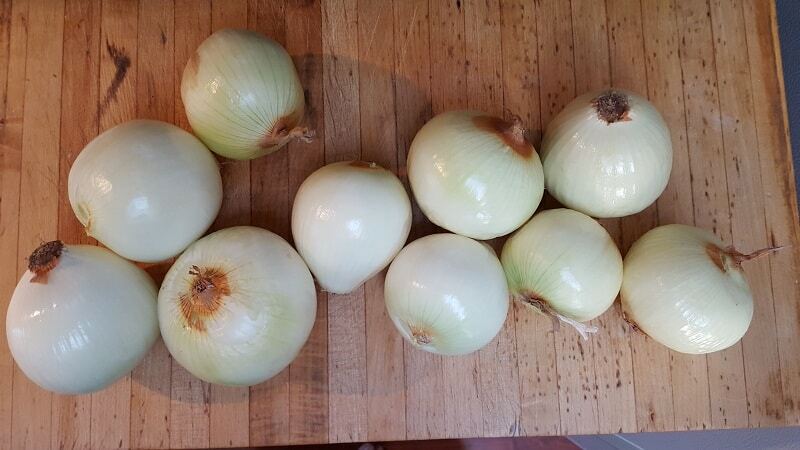 I’ll use these onions in the same pan that I roast the traditional Easter lamb on Sunday. They’ll work as a bed for the lamb to rest on, along with other herbs, in the roasting pan. Cover the skins with approximately 6 cups of water and 8 tbsp. of white vinegar. Bring to a boil and let steep. The longer the skins steep the darker the color. 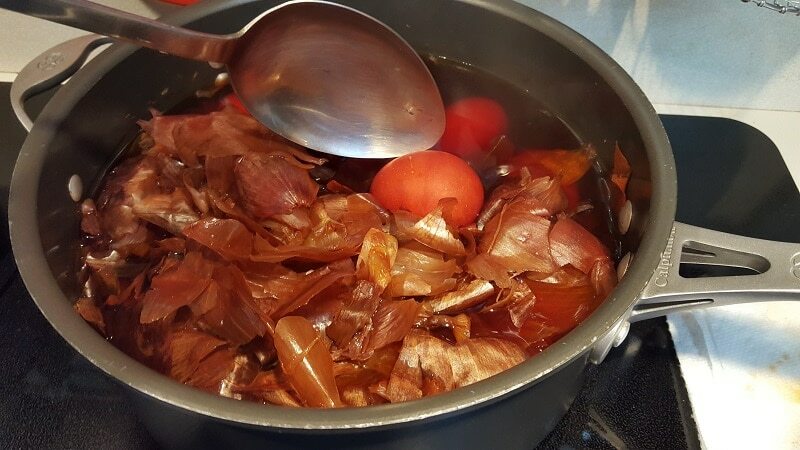 I used brown eggs with yellow onions skins to get the deeper rusty red color. You can hard boil the eggs with the skins or in the liquid after the skins have been removed. Bring the liquid back to boil and simmer the eggs for 5 to 8 minutes then take off the heat. 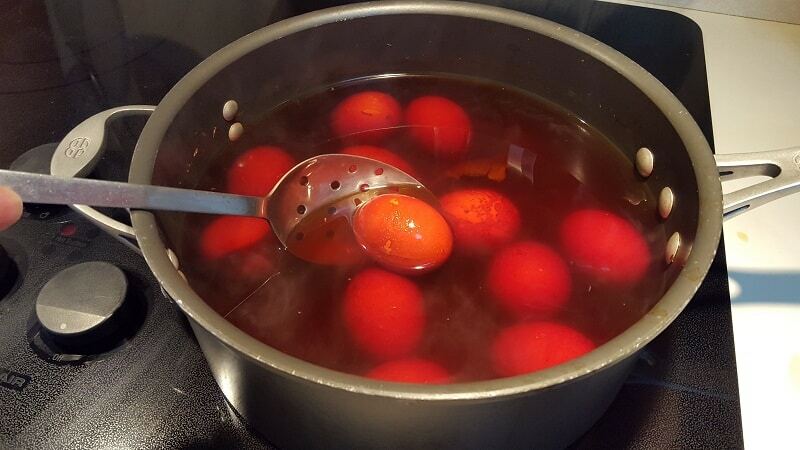 Leave the eggs in the dye until they are cool. You can also let the eggs cool in the dye and set in your fridge overnight. 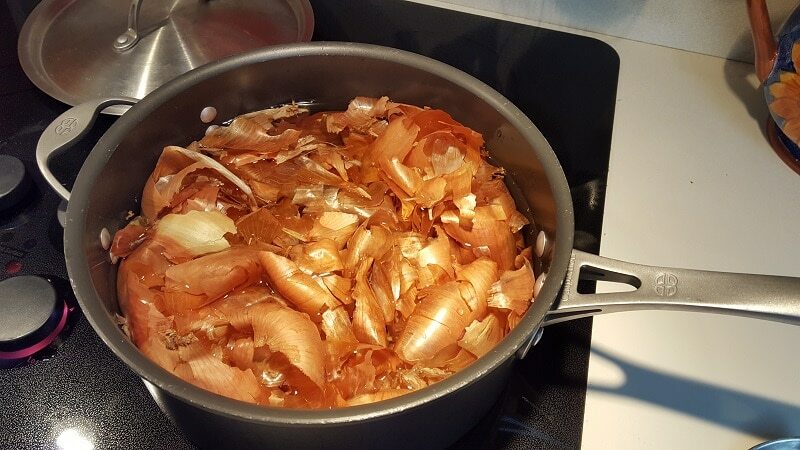 Here’s the how-to video I followed, on dying eggs with onion skins, from my friend, Blogger and Greek Chef, Peter Minaki. Kalo Pascha and Kali Anastasi! Looking for romantic Valentine’s Day Recipes? You’ve got 12 days to plan for a delicious treat. Here are some quick and easy drinks and desserts, two that include Greek yogurt, that I’ve collected for you. This drink is named after Persephone, who in Greek mythology is the daughter of Zeus. 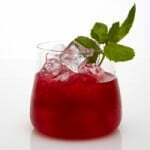 To prepare a Persephone, muddle mint leaves with simple syrup and pomegranate juice in a cocktail shaker. Add ice cubes and all of the remaining ingredients and shake well. This is a non-alcoholic recipe, but you might want to add a bit of the bubbly! 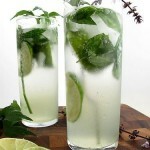 This mojito is made with Greek Metaxa brandy in place of rum. In a cocktail shaker, muddle mint with brown sugar and lime juice. Add Metaxa, lemon juice and ice. 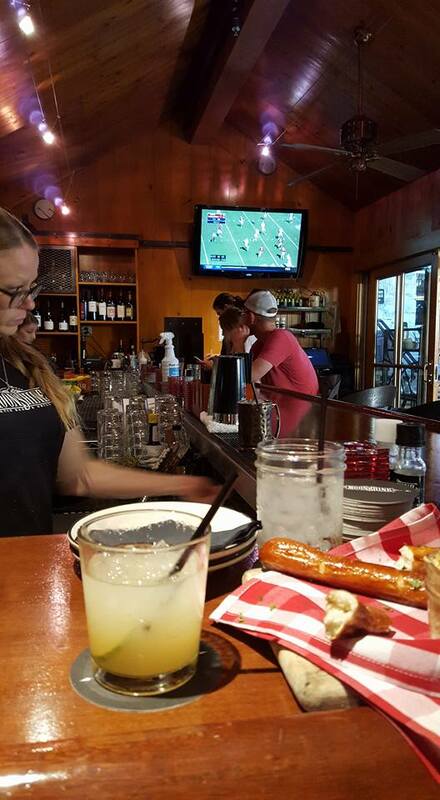 Shake well and strain into an ice-filled highball glass. Top with the club soda. How about a recipe mash-up that’s a drink and a dessert? 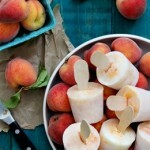 The crushed peaches in this popsicle recipe are soaked in Bourbon. I would use plain whole-milk Greek yogurt. Since peaches are out of season, I would substitute frozen peaches whizzed in a blender, even though the recipe suggests canned. These pops will need to set until the mixture is completely frozen, about 5-6 hours. Thinking of maybe a quick and easy pie for your Valentine? 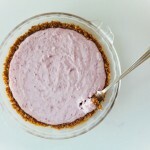 One of the ingredients for this no-bake pie is plain whole-milk Greek yogurt. The pie will need to chill until the filling is set, at least 8 hours or overnight. Kali Xronia! 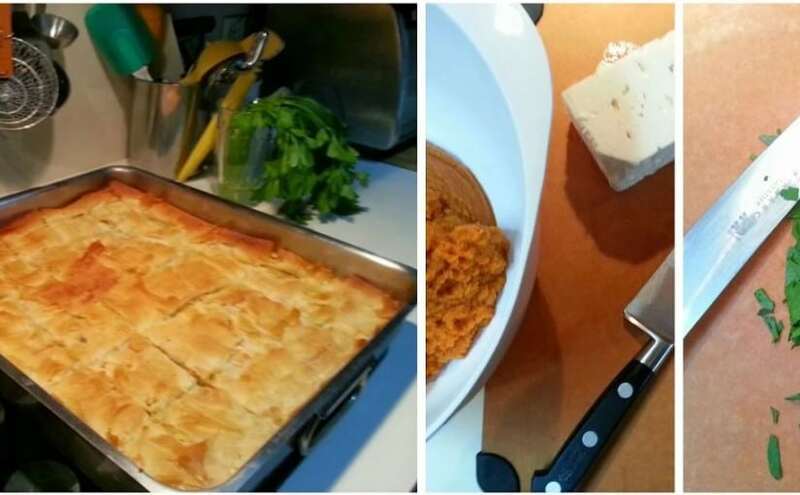 My first post for 2016 is about my 4 favorite Greek Food Blogs. These are blogs from which I draw inspiration, and bonus… they are all written in English. Diane is a Chef, and TV cooking show host, cookbook author and one of the world’s foremost authorities on Greek cuisine. Her beautifully photographed cookbook, Country Cooking of Greece, was reviewed as a “masterpiece” by the New York Times 2012, 100 best books. I’ve made Diane’s Greek Feta & Red Pepper Dip recipe and blogged about her expertise and latest book on the Ikarian diet. Peter is one of Toronto’s finest Greek food experts and author of Everything Mediterranean Cookbook. He teaches Greek cooking classes, does private catering, and hosts Greek Supper Club “pop-ups”. I’ve made Peter’s pork chops recipe, and am lucky to call him my friend. Ivy is a Greek-Cypriot home cook, whose passion for cooking started much like mine, by watching her mother cook. She is the author of Greek Home-style Cooking, and teaches private and group cooking classes. Mary is is a native Californian, born and raised in San Diego. Her blog is about the beautiful California coastline, as well as her enjoyment of Greek cooking, and sharing recipes. She co-authored Cooking Techniques with Olive Oil .